You’ve probably eaten sprouts on a salad or sandwich before and enjoyed their satisfying crunch and delicious, earthy flavor. But did you know that they also offer amazing nutritional value? Read on to learn the benefits of eating sprouts and how easy it is to make them yourself. With very little effort, you can start your own miniature farm right in your kitchen and make these tiny, nutrition-packed plants into a regular part of your diet. Almonds and other nuts, sunflower and pumpkin seeds, wheat berries, quinoa, buckwheat, lentils, beans and peas are all examples of seeds, created to reproduce the plant from which they came. They are concentrated containers of potential energy, with all of the building blocks necessary to transform from a tiny seed into an adult plant or even a tree. Their molecular complexity is partly responsible for the notorious reputation beans have, for example, of producing intestinal gas, and nuts have of causing constipation; they are nutritionally dense and therefore can be difficult to digest. However, when sprouted, the dense nutritional contents of nuts, seeds, grains and legumes are broken down naturally, making their valuable nutritional inventory more accessible to the body (sometimes referred to as “bioavailability”). Yet, unlike cooking, which also breaks down the food for easier digestion, sprouting leaves the seed’s enzymes completely intact, making digestion even more efficient. The sprouting or germination process is initiated by contact with water. First the seed absorbs the water, and its natural enzyme inhibitors (built in by nature to make sure the seed does not germinate until it has enough water to grow) are washed away. At this point the enzymes are free to begin their important work and act as catalysts to initiate cellular growth and transformation. Sprouts represent the point of greatest vitality in the life cycle of a plant. One clearly experiences this vitality when eating sprouts consistently. During sprouting, vitamin and enzyme content increases dramatically. At the same time starch is converted into simple sugars, protein is turned into amino acids and peptones, and crude fat is broken down into free fatty acids. Hence, the sprouting process predigests the nutrients of the seed, making it easier to assimilate and metabolize. This explains why grains and legumes, many of which are common allergens, often do not cause allergies when sprouted. An additional dietary benefit of sprouts is that they contain more enzymes than it takes to digest them, and so, due to the momentary surplus of enzymes in the stomach, any other foods eaten with sprouts will also be digested more effectively. Sprouts are commonly available at grocery stores and farmers markets, but it is very simple to grow them yourself – not to mention less expensive – and homemade sprouts are fresher, which means they are more vital and have a much longer lifespan in your fridge than the store-bought variety. Plus, you can make as much or as little as you need. In addition to the widely recognizable alfalfa sprouts often seen in the supermarket refrigerator case, you can sprout any dried beans, nuts, seeds or grains that have not been treated with chemicals or heat. 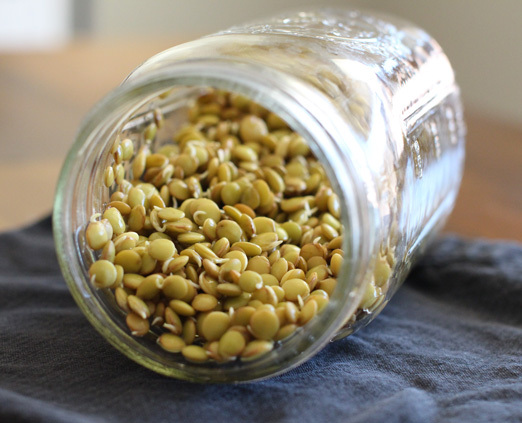 Three of my favorite homemade sprouts are mung beans, brown lentils and chickpeas. Below I’ll explain three different ways to grow your own sprouts hydroponically (without soil) – three different legumes and three techniques – however, they are interchangeable, meaning that you can use any technique that works for you on any kind of bean, depending on what equipment you have at home. 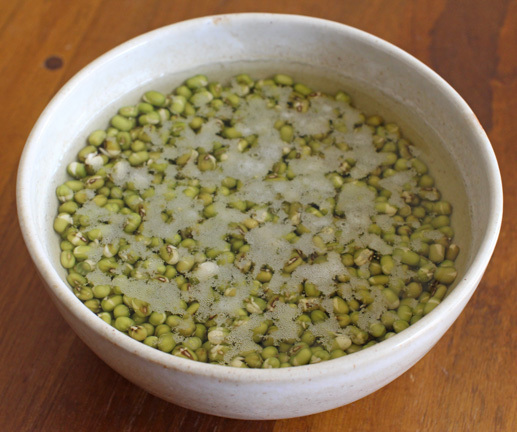 The basic first step for making any sprouts is to soak them in clean water. You can do this in a jar, a bowl or even a drinking glass. Make sure the water is deep, because the seeds/beans will absorb the water and expand to double or even triple their size, but they should remain submersed. In these three examples, I began with a half cup of dried beans. Let the beans soak in water for 8 to 12 hours. Overnight is perfect. One common question is whether you should put the beans in the fridge while they’re soaking. They’ll be just fine at room temperature for this stage of the process. After the initial soak, don’t be alarmed if the water has turned a dark color or is foamy on the surface, like shown to the left. That’s just the enzyme inhibitors that have been drawn out of the beans. Pour off the soaking water, rinse the beans well, and transfer them to a sprouting tray or other shallow dish. 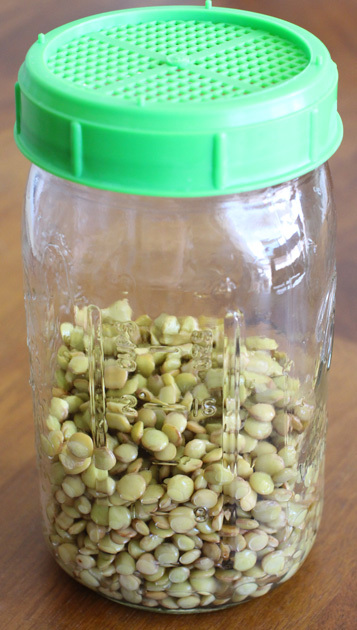 The sprouting container should have holes in the bottom or some other mechanism to hold the beans away from any water that would otherwise pool in the bottom of the container. The beans should be damp, but with air freely circulating around them. We don’t want them to be sitting in water anymore at this point. 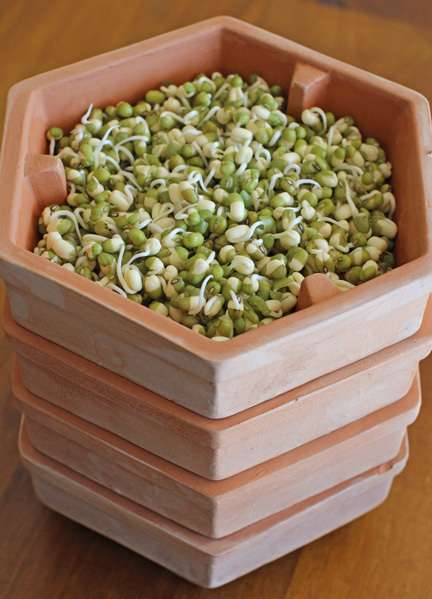 For this example, I will explain how I use my terra cotta sprouter to sprout mung beans, but as I mentioned above, you can sprout any kind of seed in a sprouter like this, or sprout mung beans using any of the methods described on this page. My sprouter, shown to the left and at the top of this article, is very similar to this one, sold on Amazon. If you’re thinking about purchasing some sprouting equipment, a terra cotta sprouter will be more expensive than a plastic one, of course. 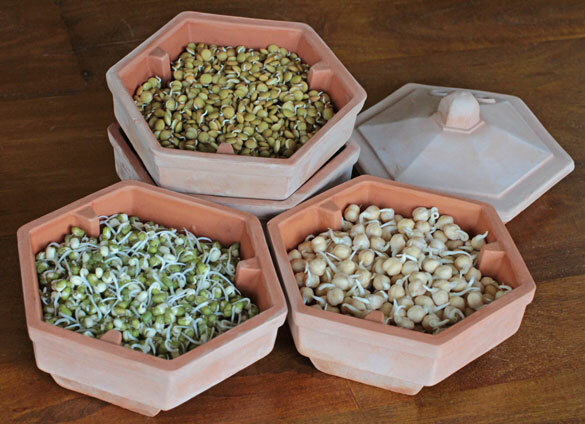 But what I love about the terra cotta, is that it absorbs and retains water after I rinse the beans, which keeps the germinating sprouts hydrated until the next rinse. (We wouldn’t want our tiny plants to dry up before their time.) And as an extra perk, it’s a lot prettier than plastic sitting on the kitchen counter, not to mention kinder to the environment, so if you’re considering making hydroponic sprouting part of your regular routine, it might be a worthy investment. The upper levels of this sprouter are perforated with tiny holes in the bottom to allow water to run away from the seeds, while the base level is solid, to hold that runoff water. There is also a lid, which I usually also wet, to help keep the seeds moist while they’re germinating. Once the soaked beans are in the trays, stack them up and cover them with the lid. This is where they will spend the next day or two. You will probably start to see the beans sprout tiny tails within the first 12 hours after soaking. At least twice a day, fill each tray with water and hold it over the sink until the water has drained out through the holes. Then stack the trays up once again and replace the lid. This is the extent of your farming duties until the sprout tails have grown to roughly the same length as the beans themselves. It’s really that easy – nature does all the work for you! The process of sprouting chickpeas is very similar. You’ll begin by soaking dried chickpeas in water overnight. By the way, canned chickpeas will not sprout, because they have already been cooked. 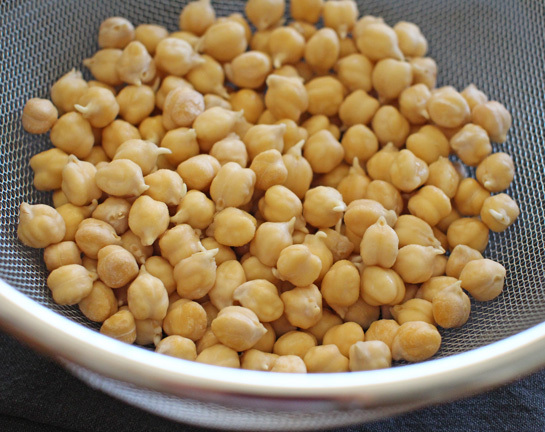 Dried chickpeas will swell significantly when soaked, so be sure to cover them with a few inches of extra water. Drain away the soaking water and give them a good rinse. In this example, we’ll sprout the chickpeas using a stainless steel mesh strainer. Transfer the chickpeas to a strainer with a bowl or towel beneath it to catch any runoff water. In the summertime, you might also choose to cover the strainer with a plate to keep fruit flies or other bugs away, as well. With this much air circulation around the sprouts, you may need to re-rinse them several times a day to keep them damp, depending on your climate. But definitely be sure to wet them at least three times each day. You should start to see tails growing within the first day after soaking. Continue to keep the sprouts moist until their tails are the same length as the chickpeas themselves. 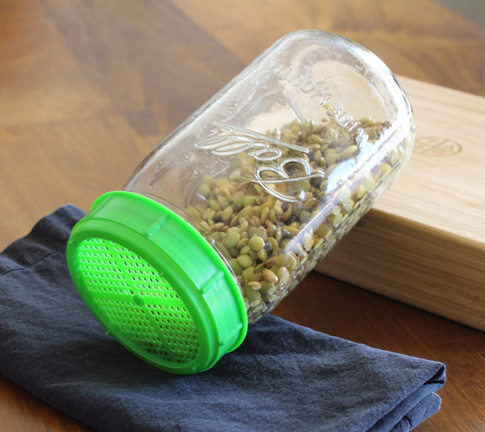 Another method of sprouting is to use a mason jar with a mesh cover of some kind. You can pick up a set of plastic strainer lids for your mason jars for just a few dollars. However, even a piece of cheese cloth and a rubber band would suffice. 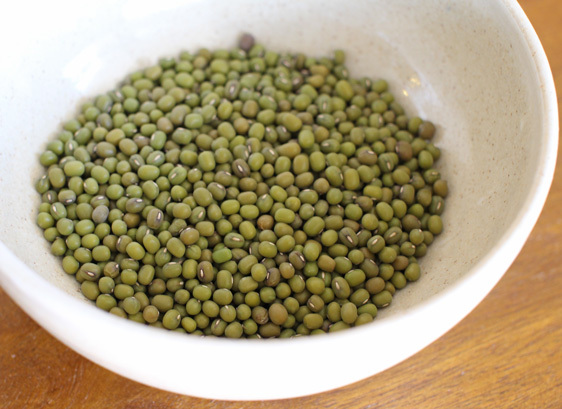 Once again, sprouting lentils is similar to other kinds of beans. One nice thing about using the mason jar technique (which, again, you can use on any kind of bean, seed or grain) is that you can do everything in one container: soak, strain, rinse and sprout. You can even store the sprouts in your mason jar (in the refrigerator) if you have a solid lid for it. Place a half cup of dried lentils in the mason jar, cover with a few extra inches of water, and let them soak overnight. In the morning, drain away the soaking water, fill the jar with clean water, and drain it away again. 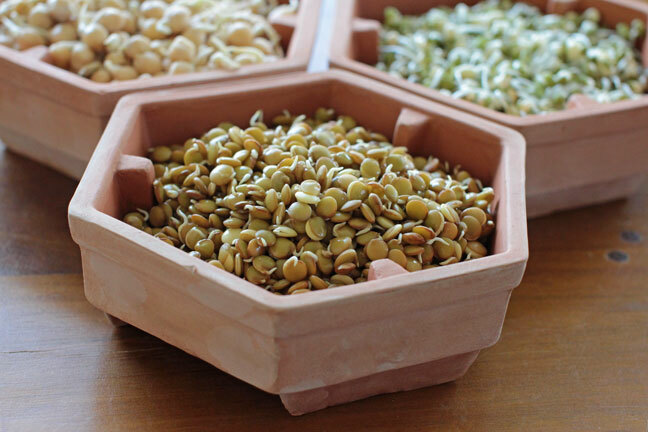 At this point in the sprouting process, you’ll want to keep the lentils moist but not submersed any longer, so it’s best to keep the mason jar inverted, perhaps on top of a towel, or on an incline with the mesh side pointing down, so excess water can drain away. Continue to rinse and drain the lentils at least twice a day, keeping the jar inverted, until they’ve sprouted tails as long as the lentils are wide. 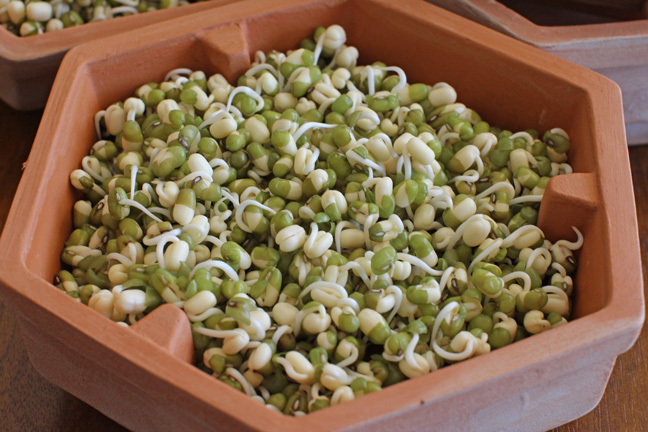 Sprouts are at their peak of nutrition at the time when the tail length is equal to the length of the bean, seed or lentil. I like to allow the moist sprouts to air dry at this point, before putting them into an airtight container and sliding them into the fridge, because if you pack them up dry, they stay fresher longer. Your ultra-fresh, living, protein-and-enzyme-packed, homemade sprouts will keep in the refrigerator for at least a week. Add your sprouts to sandwiches, salads or soups for added crunch and nutrition (like I did for my Inspired Vegetable Broth with whole wheat couscous and mung bean sprouts). You can snack on them by the handful, perhaps sprinkled with a dash of sea salt. Or, you can take off the raw edge by simmering them for a few minutes in a shallow pan or by steaming them. While cooking your sprouts will diminish some of their nutritional impact, some people may find them more palatable and digestible that way, and they’re still incredibly healthy for you even when lightly cooked, so try it out and see what you think! Intrigued? Me too! There are so many other grains, seeds, nuts and legumes you could sprout. For a veritable treasure trove of information, check out SproutPeople.org. Some sprouted seeds, such as broccoli, mustard and radish seeds, taste similar to their full-grown counterparts, making a delicious and sometimes spicy addition to salads and sandwiches. There’s a whole world of sprouting to explore. If you give it a try, please share your experience in a comment below! Do you have a favorite kind of sprout? 2 Responses to "Sprouting at Home"
Excellent article! My favorite sprout is red clover. Such tiny sprouts, so crunchy.